I felt a little bad that I got Garrek's Reavers on the table quicker than the Stormcast, but I knew from day one I wanted to convert Steelheart's Champions. His triad were always earmarked to join my Stormtonnians and their indoctrination would involve some conversion work. You can see the fruits of this labour below. These guys required some consideration and got slightly more than my usual head and weapon swaps. The solutions were fairly simple, and helped by the fortuitous way in which Liberator shields can hide all manner of sins. I also opted to join the new weapons at the wrist. I felt the fine joints on my previous conversions were structurally weak and occasionally their axis was off. But now I had to contend with the awkward way the Stormcast vambraces wrap over the wrists and the result that the arms are a fraction too long. Ah well. The new blades are Space Marine power swords rather than the previous Empire swords. Turns out not many Marines hold their swords in their right hands, so my choice was slightly limited. The most dynamic conversion is Angharad, whose active hand now bears her shield. You get a sense that she's going to smash her opponent with it, having jabbed with her blade. Obryn remains implacable, advancing with his sword in a casual grip. Severin is majestical and clearly about to demand a shrubbery as payment from someone. 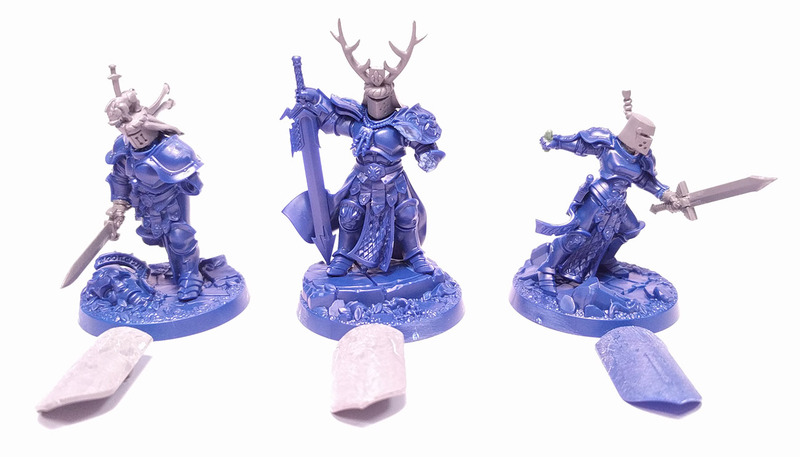 I am really looking forward to painting these guys, if only because they have more cloth on them. Severin's tabard is going to be a great chance to run heraldry over fabric in a way I've not been able to do with the older Stormcast kits. Indeed, I'm eyeing chaps like the new Evocators, as their long robes will provide even more exciting canvasses in this respect. If I get round to it I'd like to make some custom cards to replace the default Shadespire ones for the Champions. I'd denote characters by their heraldry, rather than by their portraits. This will be a good way to delve into the Stormtonnian lore a bit more. I dig 'em - The combo works rather well! They look excellent! Severin in particular has a great silhouette with that antlered helm. The distribution of Space Marine weaponry between right and left hands has annoyed me for ages. It gets even worse when you're looking for weapons other than swords, like axes or mauls. And yes, those shields are wonderful for covering up awkward joins like that. Is their heraldry going to reflect their epithets (Steelheart, Brightshield, the Bold)? Custom cards are a really cool idea. 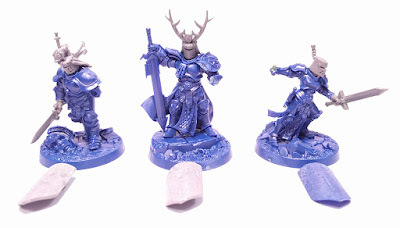 I've been thinking of doing something similar for the Farstriders, since I gender-swapped them all with my conversions, and I'd like to have names on the cards that reflected that (Elia Swiftblade instead of Elias, for instance). Great minds think alike, WestRider! Custom cards are the way forwards. I hope you will cut off the "flying" chain on Angharad's helmet. Love this project, are you still working on it? I am about to start something similar. Hey XBones, yes, the guys are basecoated but I haven't had time to progress them. Alas life has got in the way. Definitely have a go yourself.